President Mnangagwa returned last night from a successful four-nation tour of Eurasia that resulted in the signing of a raft of economic agreements as well as laying the foundation for cooperation with new partners from the region. On arrival, the President said he was happy that the country was now peaceful following a few days of opposition-led violence that resulted in loss of lives, injury and damage to property. The opposition has on several occasions said it will make the country ungovernable so as to topple the popularly-elected Government or force it into a power-sharing agreement. On returning from Russia, Belarus, Azerbaijan and Kazakhstan late last night, President Mnangagwa said: "I will be fully briefed ... on what was happening. I am happy that the country is quiet. "Our people must concentrate on doing their work. The thrust is economic development; we must grow our economy. "We want peace, we want unity among our people. There are channels for complaints if anyone has any complaints. This is the spirit and culture that we want as Zimbabweans to be developed." President Mnangagwa said he will release a statement on deals clinched during his tour. The tour started in Russia, through to Belarus and Azerbaijan, and ended with the President returning from Kazakhstan last night. 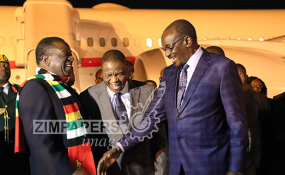 He was received at Robert Gabriel Mugabe International Airport by Vice-Presidents Dr Constantino Chiwenga and Kembo Mohadi, several Cabinet ministers and other senior Government officials and service chiefs.